Problems can arise when a family works together. That's why it's important to separate work-related and family matters. NEW YORK (TheStreet) -- Ben Cimino has been working in his family's Syracuse, N.Y.-based fresh produce business for most of his post-college life. But Cimino, 34, has been frustrated for years with the dynamics of working with his father and two brothers. (Cimino also has a sister, who does not work for the company.) According to Cimino, the lack of praise for being dependable, and in general for his hard work, has taken its toll. Island Buggies on Nantucket Island, Mass., is like any family-owned business: It benefits from being run less like a family and more like a business. "It was as if the opportunity to share the business was privilege enough," he writes in an email. Other things about working with his family bothered him, like how his older brother justified his salary only by saying he had been there longer and deserved to make more. Or the fact it was difficult to separate family and personal life from work. Most importantly, Cimino says, there was too much "gray area" in the realm of authority. "There's an obvious pecking order amongst us, but there's also a lack of ramifications for inappropriate conduct that wouldn't fly in other settings," he writes. Cimino became so frustrated that he recently quit, despite being newly married, and decided to make his dream of becoming a teacher finally a reality. Cimino already has a degree in biology and had been a substitute teacher for a short time before working with his family. Beginning this summer, he is going back to school to get his master's degree in teaching, specializing in science and special education. Cimino's frustrations about working with his family are not uncommon when it comes to small businesses, many of which are family owned. The potential for problems when it comes to working with family, many of them unique, shows how important it is to establish clearly defined processes and lines of division and separate work-related and family matters. Successful family businesses are those with families "who are able to keep the two legal entities separated by having well-crafted partnership agreements," says Carolyn Thompson, director of human resources at Goodman & Co. The agreement includes such things as having a clear understanding of each person's position and responsibilities, performance metrics for everyone, making clear "who owns the business and who are employees of the business" and having a well-crafted employee handbook, among other expectations, Thompson says. Equally important is to have such conversation with family members before conflict arises. If family members are uncomfortable having these discussions, Thompson says, they should bring in an outside coach. In essence, despite working with the people closest to you, it is important to "run the business as a business," Thompson says. "Trying to keep family drama and dynamics out of the office is really key." Bob Gellman, a director at accounting provider CBIZ MHM and author of The 7 Keys to Unlocking the Door to Your Dreams: Exit Strategies for Business Owners, says succession planning can be difficult for family-owned businesses, especially if owners prefer to sell the business instead of handing it down to children. If the business "looks like the decisions were made at the dinner table ... you will see the difference in how the business would look from the outside. "Who would want to buy a company that looked like that? And who would want to work for a company that looked like that? A lot of times family-owned businesses have reduced growth and value opportunities." But there are perks to owning a family-owned business. For one thing, you get to work with your family. 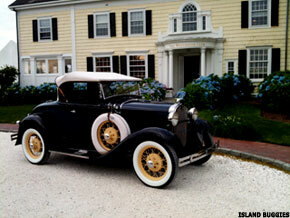 That's key for Wayne Stiltanen, owner of Island Buggies on Nantucket Island, Mass., which rents out restored classic American-made cars and offers taxi and limousine service. Island Buggies is run by Stiltanen and his wife. But since the business is seasonal, a son who lives in Los Angeles and a college-aged daughter come back to work during the summer. Stiltanen particularly appreciates some of the out-of-the-box ideas his kids have for a growing business, says the retired airline pilot, who opened Island Buggies last year. Last summer, Stiltanen, at the suggestion of his son, came up with a reduced-priced offer on rentals to generate buzz about the company. Although the offer reduced Stiltanen's profit for a short time, in the end he gained customers from the added advertising. "I thought it was a good idea," he says. Adelaine Construction in Harbor Springs, Mich., is run by partners Melissa Adelaine-Supernault, the project coordinator, her brother, Noah, the foreman, and her father, Steve, who serves as president of the residential home builder and home renovation company he founded in 1992. Adelaine-Supernault has two sisters who are not part of the business. The trio seems to have gotten it right when it comes to working with family. "We work easily 10 hours a day together and then will have a family birthday party we have to go to," Adelaine-Supernault says. Even if they had a disagreement at work that day, "we have to be able to drop that the moment we walk out the door and act like family at a family event. It's hard to do that." "We're a close-knit family," she adds. "Years ago we made a rule: You do not talk about work -- it doesn't matter what's going on -- when you are in family mode." Having clearly separated roles was imperative to being able to run the business effectively, she says. "We definitely have our aspects in the business and we really rely on each other for that," says Adelaine-Supernault, who has a degree in marketing. When it comes to making decisions, they try to be as democratic as possible, she says. Recently the brother and sister had a disagreement over advertising dollars. Adelaine-Supernault felt they should ramp up their advertising even with a tight budget; her brother resisted. "In the end we compromised," she says. "We didn't spend what I wanted, but we didn't cut back to where he wanted either." Resentment can breed quickly in family-owned businesses, particularly if a family member comes in with somewhat easier responsibilities or performs his duties with a sense of entitlement, says Dan Dalton, a partner at law firm Dalton Tomich Pensler in Detroit. Dalton specializes in small-business law. Employees, whether part of the family or not, "have to bring value to the company," Dalton says. As superiors, "you have to be ruthlessly equal to family members and nonfamily members. If a family member is screwing up, you have to discipline them just as you would discipline a nonfamily-member employee." Having mutual respect is also important, Adelaine-Supernault says. "Even though our father started the business years ago he has allowed us to shine with the credit when is due to us," she writes in a follow-up email. "It's important to feel respected and appreciated in any business, but even more so when your dad is ultimately your boss."